When you're the world's biggest tire company with a One Million dollar budget to photograph your calendar, you hire the world's top supermodels right? The Pirelli 2003 calendar features some of the most celebrated top models from throughout the world: Sophie Dahl, Yamila Diaz-Rahi, Isabeli Fontana, Bridget Hall, Heidi Klum, Karolina Kurkova, Natalia Vodianova, Sienna Rose Miller, Lisa Seiffert. And, as is now traditional, there are also some up-and-coming faces, such as Filippa Hamilton, Jessica Miller and Rania Raslan. Likewise. Pirelli's 2002 Calendar featured Hollywoods hottest young actresses including Julia Styles, Mena Suvari (American Beauty) , Rachel Lee Cook (Josie & the Pussycats) , Lauren Bush (neice of the President), Erika Christensen (Traffic), Bridget Moyanhan (Coyote Ugly, Sum of all Fears), James King (Blow, Pearl Harbor, Lonestar State of Mind). The 600cc Xtreme class features highly modified 600cc Japanese in-line fours modified to Superbike specs, and is currently contested only by, and hence dominated by, American Honda. Above is Miguel Duhamel's Honda CBR600RR. None of the other 3 Japanese teams, plus Ducati, have plans to build expensive "one off" 600cc Extreme bikes to contest the new 2005 Daytona 200 race. A July 25th, 2004 press release from AMA Pro Racing has announced "new" rule change proposals for the 2005 season. The only item of note in just a few minor changes to the rules is to allow any rider to race in any class. Effectively the AMA is trying to fill out its less than full starting grids in a confusing mirid of pro classes which have less than full support from all the factory teams, and which has effectively destroyed professional motorcycle roadracing in America since the classes were first announced for the 2004 season. When AMA Nationals like those at California Speedway, Barber Motorsports, Colorado and Virgina International are pulling less than 2,000 spectators per race weekend, the current state of AMA Pro Racing in America is a disaster. The published attendance figures of 93,000 spectators for this pastJuly's Laguna Seca World and AMA SuperbikeWeekend were an outright lie (we only counted 4,000 spectators trackside on Sunday - add in generously another 1,000 milling around in the Paddock and Midway during the race, and another 1,000 for riders and their teams and venders, and Laguna WSB Weekend more realisticly had 6,000 people total. Maybe. Daytona Superbike back in March wasn't much better. There are some 200,000 bikers in town for Daytona Bike Week, yet almost no one goes to the track to watch the racing. Plus the Superbike National at the out dated and dangerous Daytona Speedway had to be moved to Saturday so TV and spectators wouldn't miss the race if it got rained out to Monday like happened in 2002. Meanwhile, we're still waiting for the press release to follow up on the results of AMA Pro Racing's big meeting back in May with the Speedway to improve race safety. The reality is the income from motorcycle racing at the Speedway can not justify modifying the track to any sort of FIM safety standards. Unbelievably, AMA Pro Racing is doing nothing to address the major problems it created this year in the structure of the mirid of different and confusing classes themselves. The 600cc Formula Extreme class will remain a useless and boring romp for Team Honda and should be eliminated altogether, or revert back to the once popular 600cc Supersport class which was always hotly contested, along with the inclussion of Ducati's 750cc twin. Meanwhile, Suzuki still has no class to race its hugely popular GSXR750. The 1000cc Supersport class remains a useless duplication of 1000cc Superbike and should be eliminated altogether so all the factory and support teams will return to Superbike where they belong. Also in the Pro Racing 2005 rules proposal is a request for a new "Spec Bike ' class. Remember the last spec bike class the AMA tried was in the early '90s for Harley-Havidson Sportsters and it was a disaster, as the stock bikes were ill handling and not cabale of being raced without blowing up. Plus, factory riders from teams weren't allowed to race a competing brand, so effectivlely we were left with amateur riders racing junk bikes on a national pro racing weekend. Perhaps this new "Spec Class" class might be a reprive for Suzuki's GSXR750 if Suzuki foots the class sponsorship bill? But why do we need another boring one brand class in a weekend of 1 and 2 brand dominated racing? A one-brand Spec Bike Class without factory riders? No thank you. The old 600cc Supersport class fit the bill just perfect. So why doesn't AMA Pro Racing get it right? With AMA employees on a fixed salary, and a board of directors made up of motorcycle racers, team, owners and manufacturers you'ld think they could. But in reality at AMA Pro Racing there's just too many special interests involved and team managers wanting different classes they can easily win to advertise their wins and maintain their sponsorship money from the factories. Successful racing series such as NASCAR, CART, Supercross, Superbike and MotoGP are owned and operated by a private owners who have the success and profitabilty of their race series as their biggest concern. AMA needs to get out of race management and stick with just rules enforcement. Daytona 200 to be opening round of Formula Xtreme 600cc Series! Editor's note: This week's issue of Cycle News 8/10/04 features a round table discussion by CN editors Paul Carruthers and Henry Ray Abrams with AMA Pro Roadracing's chief executive Officier Scott Hollingsworth, director of competition Merrill Vanderslice, roadrace manager Ron Barick, vp of commercial developent John Ferris, director of communications Kerry Graeber, vp Andy Leisner, and director of scoring Ken Rogers. In theCN interview the Pro Racing Board let it slip out they were "considering" changing the feature class at this coming year's 2005 Daytona 200 Miler from Superbike to 600cc Formula Xtreme, but the discussions up to now regarding this were principally just between AMA Pro Racing and Daytona Speedway, without the formal support of any factory race teams or riders. Said Hollingsworth: "I don't think we're going to share what's been discussed in private discussions with those guys (some of the factory US distributor teams, and not the riders). ... Nobody's commited we're going to do that (change classes for the Daytona 200 Miler) yet." This all comes just as there was a good chance all 5 major Superbike manufacturers would be returning to compete in AMA Superbike Racing in 2005 to the benefit of increasing spectator attendace and re-establishing the lost popularity of professional roadracing in America. As we have mentioned previously, this is all taking place in a climate that AMA Pro Racing has created to continue the decline in spectator attendance and factory team participation at this year's AMA Nationals with its multitude of lightly contested, confuning and duplicate classes. The 600cc Xtreme class features highly modified 600cc Japanese in-line fours, and is currently contested and dominated just by American Honda, with the other 3 major Japanese distributors expressing no interest in contesting the class for 2005 and beyond. Previously the 600cc Superstock Class, which Extreme has replaced, was contest by all 4 Japanese maufacturers with close and exciting racing. Now it is a class which the world's biggest advocate and supporter of production based road racing, Ducati, has no bike for. In short, this situation at Daytona has come about because the AMA does not want to loose all the income generated from back gate rider and entry fees during Speedweek at Daytona, their biggest and most popular event of the year for riders and classes. While for the Speedway, paid spectator attendance and profitability at the track during Speedweek does not justify making major and expensive design changes to the track itself to keep it safe for faster Open Superbikes, or to improve the facility in the infieldroadcourse for spectators. Rather than cancel Daytona Speedweek for safety concerns at the out dated facility, the AMA and Daytona have conspired together in secret to just make low cost track changes (see the Track ReDesign Press Release also on this page), and change the Daytona 200 feature race to slower 600cc Xtreme bikesto postpone the inevidible future demise of the facility for roadracing, all at the expense of the continued decline of AMA Superbike and all professional roadracing in America. PICKERINGTON, Ohio (Black Friday Aug. 13, 2004) -- AMA Pro Racing announced today that the class structure for the 2005 AMA Chevrolet Superbike Championship will remain unchanged. Additionally, it was announced that the 2005 Daytona 200 will feature Formula Xtreme machinery. The current class structure was enacted beginning with the 2004 racing season and is expected to remain in place at least through the 2006 racing season. Proposed 2005 rule changes were announced on July 25 and are currently subject to a 30-day comment period. AMA Pro Racing credential holders can make comments on AMA Pro Racing’s RIDERS ONLY website at www.amaproracing.com/ridersonly. Hollingsworth stated that these changes, as well as the track reconfiguration that was jointly announced yesterday by AMA Pro Racing and Daytona International Speedway, are examples of the responsiveness shared by both organizations. “Together we have examined the issues, listened to all viewpoints and created a strong direction for the future,” summarized Hollingsworth. Along with the Daytona AMA Superbike race and Daytona 200, AMA Supersport and AMA Superstock events will also be featured during Daytona Bike Week beginning on Wednesday, March 9, 2005. PICKERINGTON, Ohio (Aug. 12, 2004) -- For the sixth time since motorcycles began racing at Daytona International Speedway, competitors will compete on a reconfigured course beginning with next year’s Daytona 200 Bike Week, it was announced today. The new configuration will exclude NASCAR Turns 1 and 2 and will shorten the course to approximately 3.0 miles. The previous length of the motorcycle course was 3.56 miles. The Daytona 200 By Arai, scheduled for Saturday, March 12, will now be 67 laps instead of 57. Since 1961, when motorcycles began competing at DIS, the course configuration has changed five times with distances varying from 2 miles to 3.87 miles. This is the first change since 1985. The infield portion of the course has also been altered with the exit of the infield now located after NASCAR Turn 2. Officials from AMA Pro Racing confirmed that rider involvement will be a valuable part of the construction process. “It’s important to us that our competitors are involved with this project so the plan is to bring them to Daytona at the appropriate time to provide input,” Hollingsworth said. 2005 AMA Pro Racing events kick off on Wednesday, March 9 with practice and qualifying at the Speedway and the AMA Hot Shoe Series Championship at Daytona Beach Municipal Stadium. AMA Pro Racing practice, qualifying and support races continue on Thursday, March 10 along with the AMA Progressive Insurance Flat Track Championship at Daytona Beach Municipal Stadium. For the second straight year, the Daytona Supercross By Honda will be held under the lights on Friday night, March 11. The 64th Daytona 200 By Arai is slated for Saturday, March 12. Tickets and more information for any of the Daytona 200 Bike Week activities are available online at DaytonaInternationalSpeedway.com or by calling 1-800-PITSHOP. Editor's Comments: The's a lot of positive spin in the above joint issued Press Release from AMA Pro Racing and Daytona Speedway for the road course revision, which may prove to be no more than a low cost Band Aid for what probably remains a critical wound. Eliminating the banking Turns 1 and 2 may keep Superbike tires a little cooler, but the potential for dangerous high speed blowouts and full throttle 190 mph slides through Turns 4 and the Finish Line / Turn 5 will still remain, as well as the dangerous concrete walls. For spectator viewing the revised and shorter roadcourse moved further back in the the infield without spectator bridges, may prove even less accessable on foot or visible from the front grandstands, so spectators may have even more reasons to stay away. The real Daytona fix would have been to build a new stadium road course section with great spectator viewing bleachers inside Turns 3 and 4, and eliminate the 2 most dangerous banking turns altogether, but that was obliously too cost prohibitive. Hence, the short pavement change at the back of the track which might only make a bad situation, even worse.California Speedway's similar poorly designed infield road course offering poor spector viewing only drew some 2,000 spectators per day at its AMA Nationals back in May. March 25, 2005 - Don Edde won the Daytona 200 in 1972 aboard a Yamaha TZ350. He now publishes a dealer trade magazine Parts Magazine.This is a leter he sent to us and Cycle News to follow up on a column in Cycle News last week by contributing journalist Henry Ray Abrams on the demise of this year's 2005 Daytona 200, relagated to a one brand Honda showcase attended by less than 5,000 spectators. FastDates.com has been voicing a similar opinion since August of 2004. We are glad to see someone else in the Industry havng the courage to speak on the factors contributing to the demise of pro roadracing in America. -Ed. I wanted to comment on Henny Ray Abrams’ thought-provoking Chicanery column (“A Farce”) that ran in the March 23rd issue of Cycle News. In my opinion, the two biggest issues that cloud the direction of roadracing by AMA Pro Racing is the number of classes that they run and the structure of the AMA Pro Racing Board of Directors. First, it seems clear to me that the AMA’s goal is to have lots of classes so that most, or all, of the manufacturers can win a class championship. Kind of like the Olympics when the “Medal Count” is what teams shoot for rather than any single Main Event. I know some people don’t like to hear “Back in my day,”but…back in my day, yes, we had some preliminary races during Daytona Bike Week, but there was one big shoot-out on the last day with all the big dogs on the track at the same time. That’s the kind of Daytona 200 that I won, as did Kenny Roberts, Wayne Rainey, Freddie Spencer, Scott Russell and others in their day. There needs to be a Main Event and that is what we didn’t have this year at Daytona. There are two key classes of motorcycle sportbikes – 600s and 1,000s. But we have four classes in the AMA series. Sure, some allowances need to be made for the Ducatis and other brands that emerge with less cylinders, but that can be worked out. But there is no need to have two classes each for 600s and two for 1,000s. The fan confusion is really hurting the sport. Secondly, I don’t have anything against Ray Blank or American Honda, I think Honda makes great products. But it is totally wrong, in my opinion, that only a representative from Honda should sit on the AMA Pro Racing Board and participate on all the decisions are being made, while the others sit by their mailbox waiting for the news to arrive about what the rules of racing will be. A few years back when it was announced that this one manufacturer would sit on the board, people wondered if decisions would be unbiased. Now, I think the answer is clear. As Keith McCarty replied in the “Chat Room” interview on page 16, they were notified about the switch to Formula Xtreme machines for the 200 in August. Don’t tell me that’s when Honda first knew about it. And look at the number of rule changes that have effected the Superbike class in the past three or four years as Mat Mladin and Suzuki have continued to succeed. I could be wrong, I hope I’m wrong, but that has always appeared to me to be “strategic.” Whatever the reasons have been, the result was that this year the defending champion of the race was already on his way home when the Daytona 200 started. And the Yamaha and Kawasaki team trucks were somewhere in East Texas heading west. As a result of its “for-profit” corporate structure, the AMA Pro Racing board is not required to publish its meeting minutes, so we don’t know what proposals are brought forward and how the voting goes. But I’d say the board should have been overly sensitive to the possible criticism of the bias issue, but they failed completely to do so. So how else should they think the public and industry would react to a “Daytona 200 by Honda,” with only the four factory-support Honda rider pummeling a field of privateers? Even during Bike Week and since, I’ve had conversations that range from “we have to fix the situation at the AMA” to “it’s not fixable.” Fixing what we have would seem to be the best direction as we’d hold everything together in one series. But if the latter is true, then the AMA and Honda can go do their series and the rest of the sport can go do something else. I think there are some people and organizations out there that could run events that could be very fan-friendly even with just three-of-the-four Japanese brands. Whichever way this goes, the most important aspect is that there is a level playing field for all the participants and that everyone has an equal voice. As Henny Ray pointed out, big changes are needed and it’s going to take people with some balls to make them. Editor's Note: Below is a press release from AMA Pro Racing which announced "new" rule changes for the 2005 season. The only noteworthy item we read in what are really just mionor changes are to allow any rider to race in any class. Effectively the AMA is trying to fill out its less than full starting grids in classes which have less than full support from all the factory teams. PICKERINGTON, Ohio (July 25, 2004) -- AMA Pro Racing has announced the proposed technical rule changes for the 2005 AMA Chevrolet Superbike Championship. AMA Pro Racing licensed riders and credential holders may comment on proposed rule changes during a 30-day period beginning Monday, July 26 through Wednesday August 25. 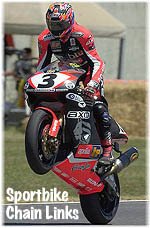 Comments can be made on AMA Pro Racing’s RIDERS ONLY website at www.amaproracing.com/ridersonly. At the conclusion of the 30-day period, AMA Pro Racing will review submissions prior to forwarding the package to the AMA Pro Racing Board of Directors for ratification. 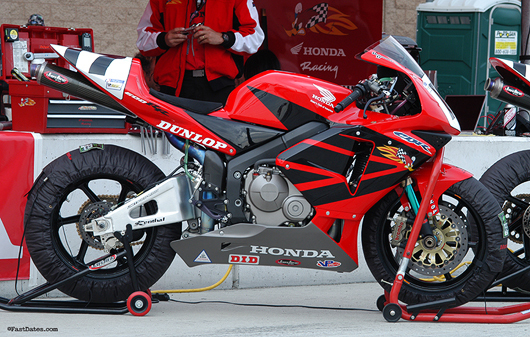 Proposed technical rule changes for the 2005 season can be viewed at www.ussuperbike.com. The 2005 AMA Chevrolet Superbike Championship will include current support classes (Supersport, Formula Xtreme and Superstock) and discussions are ongoing to include a spec class at certain rounds. Scott Hollingsworth, AMA Pro Racing CEO confirmed that 1000cc Superbikes will remain the premier class in the championship. Currently Ducati, Honda and Suzuki field factory-supported teams. Each manufacturer has earned at least one victory in the 2004 season. PICKERINGTON, Ohio (Oct. 14, 2004) -- AMA Pro Racing announced today that Chevrolet will not return as title sponsor of the AMA Motocross Championship or the AMA Superbike Championship in 2005. Chevrolet has been title sponsor of both championship series since 2000. The strategy originally was to support Chevy’s truck division then was expanded at the beginning of the 2004 racing season to include Chevrolet’s entire model line-up. “Chevrolet has been a tremendous partner with us for the last five years and we sincerely appreciate that support,” said John Farris, AMA Pro Racing Vice President of Commercial Development. AMA Pro Racing maintains a commercial development staff specifically tasked with developing and maintaining sponsor relationships. (Question - What has Farris and his staff of pros been doing the past 5 years to support Chevrolet or bring in potential new outside sponsors -Ed).